AUGUST 21, 2012 – I’ve been toying around with the idea of starting a blog for a while as a forum to share insights, nuggets, and practical how-to principles that will help others live a life of personal significance. My hope and prayer is that these posts will be helpful to you and also spur some lively discussion as we challenge each other to live with greater impact. I believe with all my heart that God has designed each one of to live with great significance and to have a powerful and positive impact on the world around you. The challenge is that we often get so busy that we end up settling for survival instead of reaching for significance. So let me start this blog by asking a question and getting some feedback: As you look at your own life, in what ways do you feel like you’ve settled for survival instead of reaching for significance? 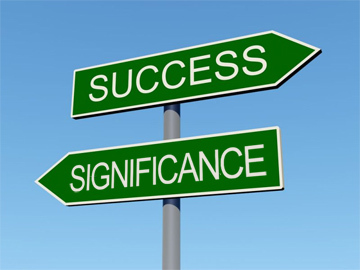 In what areas of your life do you wish your life was more significant? I am so excited for your new blog! I think I have settled for survival at my job. I hope to make a more significant impact during my time there. I look forward to your great insights. Love you George. I totally agree Lisa. Parenting (i.e. shaping another human being’s entire existence) is by far one of the most significant endeavors we are given by God. Yet many times I settle the victory of not loosing my temper amidst the volatile combination of fatigue and frustration. I’ll be posting some significance building insights for parents that have come from both victories as failures. Awesome, thanks for sharing, George! I look forward to sharing your insights with others. Jesus bless you. I settle for survival in my relationships with people. I have built myself a fortress of survival as a child to protect myself, but I am 26 now and seeing I still have those walls of defense up and instead of protecting me, I just end up hurting others. I wish my life was more significant in helping others. Great start to a blog George. Those lessons are a great foundation for guiding our lives. I agree with all of them. I think the area of my life that I struggle to have the most significance is sadly relationships. The Lord is of course growing me to be able to be vulnerable and love recklessly, but my fear of man has kept me from diving in. I find myself keeping things surfaced sometimes because of fear of being hurt or being judged. I will sure be tuning in!!! I see the different phases of life as seasons, and the more you stress and struggle while in that paticular season, I think you miss what God has for you during that paticular time.